Update April 2019: City Staff’s report on Toronto’s Transit Expansion Program – Update and Next Steps, including the Waterfront Transit Network and the Union Station to Queens Quay Link, will be considered at the April 9 meeting of the Executive Committee of City Council. Executive Committee Report EX4.1 can be accessed here. The attachment including an overall update on the Waterfront Transit Network can be accessed here and the attachment with specific analysis of the Union Station Queens Quay Link can be accessed here. New materials on the Union Station to Queens Quay Link Study are now available in the project tab below. On January 31, 2018, City Council endorsed the overall Waterfront Transit Network Plan, and directed staff to proceed with more detailed follow-up planning and design studies according to priority. The City is now moving forward with next steps in the Waterfront Transit Network Plan. Current work includes refinement and evaluation of options for the connection of higher order transit between Union Station and Queens Quay, and 30 per cent design of the streetcar extension between Exhibition Loop and the Dufferin Gate Loop. Toronto’s waterfront is currently undergoing a significant transformation, with rapid growth in many precincts along the water’s edge including Mimico, Humber Bay Shores, Liberty Village, Fort York, King/Spadina, City Place, South Core, and King/Parliament. Growth in several more precincts along the waterfront is either underway or planned, including Lower Yonge, North Keating, Port Lands, South of Eastern, and the emerging East Bayfront, Quayside, and West Don Lands neighbourhoods. With this growth, a number of key recreational and cultural destinations have emerged along the waterfront. To be kept updated about the project, including upcoming consultation opportunities, email waterfronttransit@toronto.ca to be added to our mailing list. On March 4, 2019, we held a public meeting to gain feedback on the transit-technology options and finds of analysis for the link between Union Station and Queens Quay. The public meeting included a presentation and display panels. In September, we held a public meeting that included a presentation of the study findings to date and a range of options. On May 25, 2016, we held a public meeting that included a presentation of the study progress to date and a range of preliminary transit concepts under consideration. The Executive Summary of the Union Station to Queens Quay Link Business Case can be accessed here. Please email us at waterfronttransit@toronto.ca if you wish to view the full report. As directed by Council, the City, TTC, and Waterfront Toronto are working with an external consultant team to complete a focused feasibility study and evaluation of higher-order transit options to connect Union Station to existing & approved light rail transit lines east and west of Bay Street along Queens Quay. The existing underground streetcar infrastructure, consisting of a ~ 540-metre long tunnel under Bay Street from Queens Quay Station to Union Station, opened in 1990. This existing link provides connections between the central-western waterfront, TTC Line 1, GO trains and buses, and the lower downtown core. The existing streetcar loop at Union Station is currently inadequate for present service levels, to and from the west only, because of its single, curved streetcar platform, on a single track, with insufficient space for present volumes of waiting and alighting customers, and the loop would not function effectively or safely if additional service from the east was added. Currently, options for the link between Union Station and Queens Quay have been narrowed down to a short list of technologies: expanding the underground streetcar capacity at Union Station (loop expansion); or, repurposing the existing underground streetcar tunnel with an automated dual-haul cable-pulled transit system. 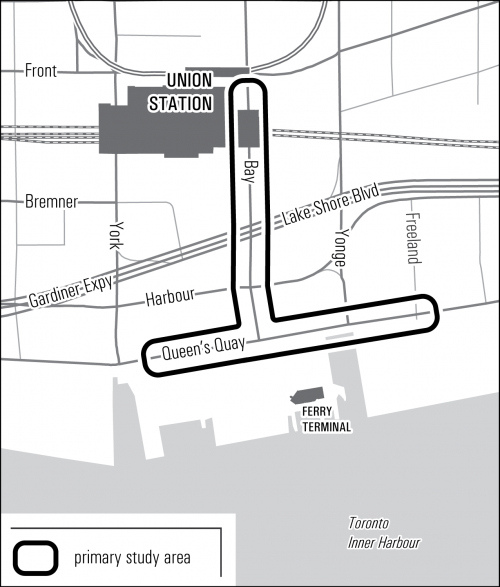 The study area for the Union Queens Quay Link is illustrated below. As directed by Council, TTC is undertaking a 30% design for an exclusive streetcar right-of-way extension between Exhibition Loop and the Dufferin Gate Loop. Increasing options for service by connecting the Exhibition Place multi-modal transit hub to existing streetcar tracks on Dufferin, King, and Queen Street in Liberty Village and South Parkdale. Allowing for an extended 509 streetcar route between points west of downtown and the lower downtown core, potentially providing some relief to transit congestion on the 504 King streetcar. Including upgrades to the Dufferin Gate Loop to increase its capacity and efficiency, and improve the customer environment. Allowing TTC transit service through Exhibition Place at all times of year. Currently, TTC bus operations within Exhibition Place are restricted during major events. The exclusive right-of-way design would allow TTC to continue to operate transit services through Exhibition Place during major events. Unlocking the potential for further westward extension of a new exclusive streetcar transit corridor along Lake Shore Boulevard to southern Etobicoke. 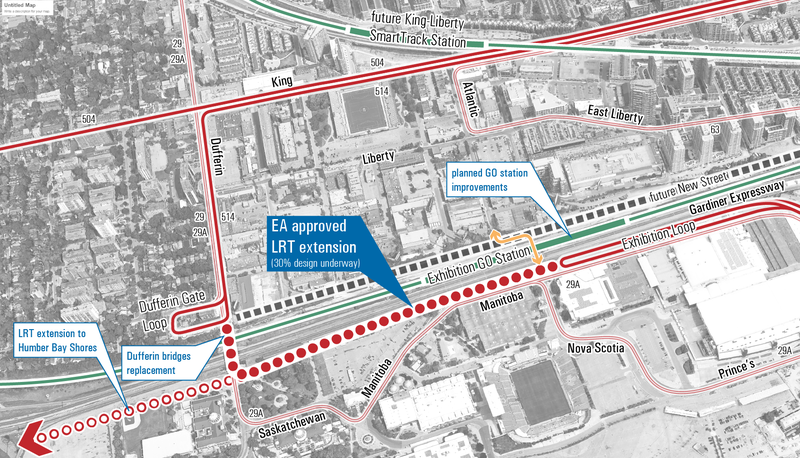 Metrolinx improvements to Exhibition GO Station will help accommodate post-event surge crowds and improve connectivity between Liberty Village and Exhibition Place, a key City-building objective. Together, the City, TTC and Metrolinx are working to coordinate improvements at this local and regional transit gateway. The City is anticipating to report back to Council on next steps for the design, construction, and associated financial implications of the planned exclusive streetcar right-of-way between Exhibition Loop and Dufferin Loop in Q2 2019. The integrated network solution for waterfront transit is being coordinated with the directions emerging from other major transit initiatives that are currently underway, including Smart Track, Relief Line, Scarborough Transit Planning, and the Metrolinx Regional Express Rail (RER) expansion program. Numerous studies have been undertaken for segments of higher order transit that would connect to/complement the existing 509 Harbourfront LRT and 501 Queen Streetcar; some Environmental Assessments (EAs) have been approved but not implemented (e.g. East Bayfront LRT); some EAs were started but never completed (e.g. portions of a western waterfront LRT); and other studies, some completed and some in progress, include provisions for higher order transit or service upgrades (e.g. Central Waterfront Secondary Plan, Proposed Park Lawn Loop). At its meeting of November 3 and 4, 2015, City Council directed staff to work with the TTC and Waterfront Toronto on a comprehensive review of waterfront transit initiatives and options (Item EX 9.9). An external consultant, Steer Davies Gleave, was retained to assist staff with the review. The study area is from Long Branch in the west to Woodbine Avenue in the east, and south of the Queensway/Queen Street. The Waterfront Transit “Reset” was divided into two phases. Council approved funding for Phase 1 of the “reset” for the following work program items: review all relevant background material; create an overall study vision with related objectives; develop a preliminary list of improvement concepts; consult with the public and stakeholders; identify preferred concepts for further study; and develop a scope of work for Phase 2. The Phase 2 work provides a plan for a resilient Waterfront Transit Network that can adapt to 21st century mobility and placemaking trends. The overall plan and directions for the network were generally well received by the public and stakeholders. Although a solution for the underground link to Union Station was not reached during this phase, there is general understanding and agreement that further focused work is required to arrive at a complete sustainable mobility solution for this area, and then to move quickly to implement the solution. In view of these findings, staff recommend that City Council endorse that upcoming updates to the City’s Official Plan be made in accordance with the waterfront transit network recommendations, and authorize identified funding requests and further study and design of areas of the network according to priority. There is an overall public expectation that completing the next steps and implementing solutions will be a key priority for the City, the Toronto Transit Commission and Waterfront Toronto. November 3 and 4 2015 – City Council direct City staff, working with the Toronto Transit Commission and Waterfront Toronto, to undertake a Phase 1 review of waterfront transit initiatives and options, and provide a status update to Executive Committee in the first quarter of 2016, such review of waterfront transit initiatives and options to include the proposed ShoreLine (closing the gap on the dedicated streetcar right-of-way between St. Joseph’s Hospital and Exhibition Place), the relocation of the Humber Loop, the Park Lawn – Lake Shore Transportation Master Plan currently underway, the possibility of a new GO Transit stop at Park Lawn, the proposed Legion Road extension, the proposed AM peak turning restrictions on Park Lawn Road from the Gardiner Expressway, the Mimico By the Lake Secondary Plan (Mimico 20/20), the Long Branch Avenue Study, and 2150 Lake Shore Boulevard West (former Mr. Christie bakery site). July 12-14, 2016 – City Council direct the Deputy City Manager, Cluster B, and the Chief Planner and Executive Director, City Planning in partnership with the Toronto Transit Commission and Waterfront Toronto, to initiate Phase 2 of the Waterfront Transit “Reset” for further development and costing of alignment concepts, detailed analysis of transit operations and ridership, identification of priority segments, as well as the creation of a Business Case and implementation strategy for delivering a coordinated waterfront transit solution. January 31, 2018 – City Council endorse the overall Waterfront Transit Network Plan (as shown in Figure 1 to the report (January 10, 2018) from the Deputy City Manager, Cluster B), and direct the Chief Planner and Executive Director, City Planning, to incorporate the Waterfront Transit Network Plan into the second phase of the Official Plan Review of Transportation and Transit policies. City Council request the Deputy City Manager, Cluster B, and the Chief Planner and Executive Director, City Planning, in partnership with the Chief Executive Officer, Toronto Transit Commission, to report back on the next steps for design and construction, and associated financial implications of the exclusive Toronto Transit Commission transit right-of-way extension between the Exhibition Loop and the Dufferin Gate Loop in the second quarter of 2019 or earlier. City Council direct the Deputy City Manager, Cluster B, and the Chief Planner and Executive Director, City Planning, in partnership with the Toronto Transit Commission and Waterfront Toronto, to complete a focused feasibility study of light rail and automated funicular technology options for connecting transit below grade between Union Station and Queens Quay, and the extension of light rail along Queens Quay East, and report back on the preferred overall solution, including a refined cost estimate and next steps for design and construction to the Executive Committee in the second quarter of 2019 or earlier. City Council request the General Manager, Transportation Services, in partnership with the Toronto Transit Commission, to extend the scope of the Park Lawn Lake Shore Transportation Master Plan Environmental Assessment currently underway to include and prioritize an exclusive transit right-of-way along Lake Shore Boulevard West, from approximately Legion Road to the Humber Loop and to include detailed analysis and modelling of impacts to motor vehicle traffic travel time, throughout and turning movements along Lake Shore Boulevard West and connecting accesses. City Council request the General Manager, Transportation Services, in partnership with the Toronto Transit Commission, to undertake a review to improve transit operations in the interim at the intersection of Bathurst-Fleet-Lake Shore, including the previously approved closure of westbound Fleet Street to automobiles between Iannuzzi Street and Bathurst Street. City Council direct the Deputy City Manager, Cluster B, the General Manager, Transportation Services, and the Chief Planner and Executive Director, City Planning, in partnership with the Toronto Transit Commission and Waterfront Toronto, to prepare background studies required for a Transit Project Assessment Process Environmental Assessment of the realignment and exclusive right-of-way operation of streetcars on Bathurst Street from Fort York Boulevard-Bremner Boulevard to Queens Quay, and on Queens Quay from Bathurst Street to Spadina Avenue. City Council request the General Manager, Transportation Services, in partnership with the Toronto Transit Commission, to undertake a review to improve transit operations for the section of the Toronto Transit Commission streetcar network on Lake Shore Boulevard between Long Branch and Legion Road. City Council direct the Deputy City Manager, Cluster B and the Chief Planner and Executive Director, City Planning, in partnership with the Toronto Transit Commission, to prepare background studies required for a Transit Project Assessment Process Environmental Assessment of a new exclusive transit right-of way from Colborne Lodge Drive and The Queensway to Dufferin Street at the Dufferin Gate, as per the preferred route identified in the report dated January 10, 2018 entitled Waterfront Transit Network Plan. City Council request the Deputy City Manager, Cluster B, the General Manager, Transportation Services, and the Chief Planner and Executive Director, City Planning, to continue to consult with St. Joseph’s Health Centre and other stakeholders on providing accessible access to the hospital. City Council direct the Interim Chief Financial Officer to include eligible components of the Waterfront Transit project in the City’s development charges by-law review currently underway. City Council direct the City Manager to forward City Council’s decision to Metrolinx for consideration in the ongoing review of the Regional Transportation Plan for 2041. The Waterfront Transit Reset study area extends from the Long Branch GO Station and the Mississauga border in the west to Woodbine Avenue in the east, and south of the Queensway/Queen Street corridor to Lake Ontario. The primary study area was refined at the conclusion of the Phase 1 work. While the integrated network solution for Waterfront transit was focused on this area, some assessments particularly related to travel patterns may have included areas as far north as Bloor Street and Danforth Avenue in the north, and Scarborough to the east.